Synopsis: In a dynamic new portrayal of Arthur Conan Doyle's most famous characters, Sherlock Holmes sends Holmes and his stalwart partner Watson on their latest challenge. Revealing fighting skills as lethal as his legendary intellect, Holmes will battle as never before to bring down a new nemesis and unravel a deadly plot that could destroy the country. The action-adventure mystery Sherlock Holmes is helmed by acclaimed filmmaker Guy Ritchie, for Warner Bros. Pictures and Village Roadshow Pictures. 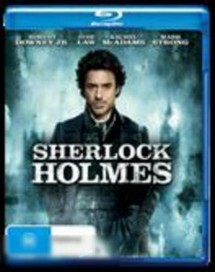 Robert Downey Jr. brings the legendary detective to life, and Jude Law stars as Holmes' trusted colleague, Watson, a doctor and war veteran who is a formidable ally for Sherlock Holmes. Rachel McAdams stars as Irene Adler, the only woman ever to have bested Holmes and who has maintained a tempestuous relationship with the detective. Mark Strong stars as their mysterious new adversary, Blackwood. Kelly Reilly plays Watson's love interest, Mary.